Comment: The Design between each chapter leads back to the index. This is an elementary work of Swami Omkarananda for students of philosophy. It will be very valuable also to all spiritual seekers who are trying to discover strong rational foundations for their spiritual aspirations and development. Philosophy is an important discipline, and therefore has a special Chair and Department in every university the world over. 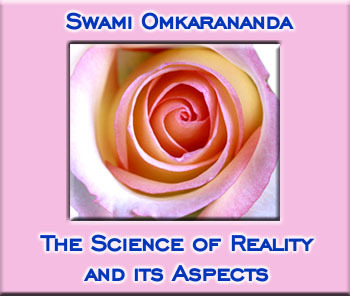 Because Swami Omkarananda considers philosophy to be primarily the science of Reality and has touched upon a few of its important fields herein, we have entitled the work "Science of Reality and Its Aspects". The Swami thinks that the soul of philosophy lies in a thoroughly rational and logical investigation of the nature of the Reality and its structural relations to the universe and the human individual. The intellectual disciplines of philosophy, and the insights it presents into the ultimate Being, are of great importance to true seekers after Truth, if they are not to lose their way to Perfection in blind alleys and false paths. Ontology is the science that treats of the principle of pure Being. It is that part of philosophy which investigates, explains and treats of the nature and essence of things. It is the science of Being or Existence. It is the inquiry into the nature of Being and of its relations to its manifestations, or appearances. Ontology is metaphysics. What is the nature of ultimate Reality? What stuff is the universe made of? We see in nature material bodies without mind, and material bodies with mind. So, nature is composed of mind and matter. Mind and matter are, possibly, the factors of Reality. This is dualistic philosophy. In India, this dualistic philosophy is known by the name of Sankhya philosophy. It was propounded by the sage Kapila. It is, however, not so simple as Western Dualism. But still it posits two realities, Purusha and Prakriti. Purusha is spirit or consciousness. Prakriti is matter. But, dualism cannot explain the interaction of mind and matter. Modern physics suspects continuity between matter and mind. It gives place to Monism. Behind all appearances, there is the same stuff. Reality is one homogeneous substance. If it is matter, the resulting philosophy is Materialistic Monism, or simply Materialism. According to it Reality is Matter, or ultimately material in its nature. The ancient view about it was that it was a single element. According to Thales it is water, according to others, air, or fire, etc. Later on, it was held that reality is atomic. It is a mass of atoms of matter. The present materialistic view is that the physical world of space is the only Reality. All forms of Reality must somehow or other be comprehended in it. This is the central thesis of Materialism. It is also called Naturalism, because it holds 'nature' to be the ultimate Reality. Recent scientific researches have bombarded the atom to find waves of energy. Whether nature is energy or atoms, the philosophy is still Naturalism. In this energy aspect, Naturalism becomes Energism. Naturalism explains consciousness as a product of the brain. According to Huxley consciousness is an epiphenomenon. It is merely an accompaniment or a by-product of changes in the nervous matter of the brain. This view is called Epiphenomenalism. On the whole, Naturalism cannot satisfactorily explain the workings of consciousness. But, some philosophers think that Reality is neither matter nor mind. According to this view, matter and mind are the two aspects or attributes of Reality, which is different from these. Reality is God. holds that Reality is not so simple as to be reducible to one, or two, substances. It is a complex in which many independent and self-existent substances dwell. Leibnitz was in a sense a pluralist. In its ancient atomic force, Reality was supposed to be a plurality of ultimate particles. This was Materialistic Pluralism. Plato was also a pluralist. He postulated many eternal Ideas, or types of perfection, towards which every human being was approximating. Since these were not material, and did not exist in the world of matter, Plato's pluralism was Spiritualistic Pluralism. Leibnitz's, too, is spiritualistic, since the ultimate nature of his monad is not materialistic. is advocated most ably by William James, the famous American psychologist. He protests against "the block universe" presented by Absolutism, by the school of idealist philosophers who hold that Reality is a spiritual unity. So many relations in the universe do not demonstrate the unitary character of Reality. They are only accidental. It is wrong to infer from relations and "relatedness" in the universe that Reality is one. Relations are not definitive. The character of Reality as one is not implied in the relations. According to Pluralism, things are sufficiently independent. We can know them in parts without worrying about the whole. There is "no all-comprehensive providence". Pluralism says this. In the universe there is unity as well as variety. There is relevance as well as irrelevance, disjunction as well as conjunction, essence as well as accident, good as well as evil, cosmos as well as chaos. Professor Spaulding has given a newer form of Pluralism. According to it the world of thought and values has realities of its own. Errors, proofs, arguments, postulates etc. are realities by themselves. Space, time, relations, beauty, goodness are realities by themselves. This view may be called Realism or Realistic Pluralism. It says that the world is composed of many things, each being real. At most, you can say that non-physical and non-mental things subsist. They are subsistent. There is a passivity in them. Physical and mental things exist. They are existent. Professor Spaulding thus emphasizes the objective and independent character of the values of life. They do not depend upon an experiencing or perceiving mind. Pluralism believes in God only as a part of the universe. Pluralism is empirical. It does not appeal to the higher metaphysical mind. Reality is non-materialistic. Idealism is the antithesis of Naturalism or Materialism. The fundamental principle of interpretation of the universe, and of nature, is 'ideal'. Nature is merely phenomenal. Nature is a system of appearances. Behind the appearances Reality is "ideal". According to Materialism the order of nature is independent of mind. According to Idealism it depends upon mind. For Materialism the world is merely matter in motion; its law is causation. For Idealism the elemental things in the universe are views of life, reason, ideas, thoughts and personality. Mind is not a mere epiphenomenon. It is the Reality and matter is merely an appearance. Matter is subordinate to mind. The great positive thesis of Idealism is this: Reality is of the nature of mind; it cannot be of the nature of matter. Materialism emphasizes the spatial, pictorial, corporeal, sensuous, non-valuational, factual and mechanistic. Idealism stresses the supra- or non-spatial, non-pictorial, incorporeal, supra-sensuous, normative or valuational and teleological. Idealism essentially, in its various forms, implies that Reality is somehow bound up with idea, mind, spirit, person, ideals, soul and life. So, it is also called Spiritualism, Mentalism, Personalism. c) Reality, being of the nature of mind, cannot be known by the senses. It requires a supra-sensuous agency to know it - reason according to rationalists, intuition according to intuitionists. What intuition is and how it can be developed is a most debated point with the philosophers of the West, so far as the practical realization of Reality is concerned. The proof of Idealism lies in the distinction between Reality and appearance. The latest discoveries of physics have established that the solidity of matter is an appearance. In reality, it is "a dance of molecules separated by proportionately vast spaces". This can be easily understood from the example of the wheel. The wheel is at rest. Even a buffalo can pass through the spokes of the wheel. The wheel, in other words, is not solid. Let the wheel rotate at a very high speed. The spokes cannot be seen now. The wheel now seems to be solid. Now, even a pin cannot pass through it. Why? Not because it is solid, but because it is in motion. So, nature is appearance. Reality is the ground of appearance. Reality is highly dynamic. The world of sense-experience is only a very imperfect copy of the world of archetypal Ideas. In the world of sense-experience everything is trying to approximate itself to its original perfect model in the world of perfection. The world of perfection alone is real. We can imagine what the world of perfection is by removing imperfections from the idea of the thing we actually see. We have not yet seen the perfect man. We can, however, think of the perfect man by removing, in our thought, the imperfections of man on earth. Corresponding to this idea of the perfect man we will find so many in another world. Perhaps Plato made use of the religious seventh heaven, the Pitru Loka of the Hindus, where only those dwell who attain to all-round perfection. "Ideas" are the only direct objects of human apprehension. They are subjectively and privately possessed. One can be sure of one's ideas only. One, therefore, can doubt everything else. Idealism, therefore, assumed the form of Acosmism. It says that the world is only the projection of our minds. It asserts the "non-existence" of material being. We are led to metaphysics. we have pure Idealism or Immaterialism. It says that ontological reality is absolutely ideal. It is either mind, or spirit, or soul, or person, or archetypical Ideas of Plato, or thought. Accordingly, we have Spiritualism, Mentalism, Monadism, Pan-Psychism, Idealistic Phenomenalism. Metaphysically, we have self-consciousness and purposeful activity, either personalistic or impersonalistic. Personalism has many terms. asserts that Reality in the universe is, ultimately, spirit. It has been diversely called as Pneuma, Nous, Reason, Logos. The spirit is an Over-Mind, quite akin to human spirit. It pervades the entire universe. In religion (Christianity in Europe), it emphasizes that God is Spirit. In worship the human spirit directly corresponds with the Divine Spirit. Worship is verily such correspondence. It is the view that the world of sense-experience is merely a realm of ideas. What ultimately exists are the Absolute Spirit and finite spirits. It asserts that the physical body of man goes out of existence after death. The astral body, as spirit, still remains. Through mediums it is possible to communicate with them. It asserts that ultimately spirit is immortal. Individual minds and their subjective states are ultimately real. It covers Berkeley's subjectivism. According to it the objects of the world enter our consciousness merely as ideas. So, the whole world is my idea. Objects are merely bundles of sensations or perceptions of a knowing subject. God produces these ideas in our minds. Hence the world, ultimately, is God-sustained. "ESSE EST PERCIPII". The reality of a thing - or of the world - lies in its being perceived or known. It covers also the pan-psychism of Leibnitz. His 'monad' is essentially a psychic entity. Every particle throbs with life. Mind is universal in nature. Leibnitz's interpretation of nature is also called Monadism. It is an attitude chiefly epistemological in nature. What we know and can know are merely phenomena. Phenomena are manifestations of Reality which we can never know. Idealistic Phenomenalism asserts that Reality is ideal. Phenomena are sufficiently indicative of the non-material nature of Reality. Essentially, Phenomenalism is the theory that knowledge is limited to phenomena. These are physical. The totality of sense-perceived objects comes within the ambit of physical phenomena. b) Idealistic Phenomenalism asserts the Reality of things-in-themselves, but denies their knowability. Hegel's idealistic philosophy is called Absolute Idealism. The Hegelian tradition is still continued by some great thinkers of our own day. F. H. Bradley, Edward Caird, B. Bosanquet and others, are advocates of Absolute Idealism. Nature is a process of thinking. World processes are unfolding reason. Nature and history are great thought-processes. Through these the Absolute Mind is coming to self-consciousness. As it advances it expresses itself in art, religion and philosophy. Reality is nothing but "a system of thoughts expanding into self-consciousness". The universe is either a mental fact or the experience of an Absolute Mind. Bradley holds that our world is a fact of mind. There must be an Absolute Mind which resolves all contradictions and conflicts in our thinking. Our finite minds can know only appearances. This absolute Mind knows Reality. Green, Bosanquet and others stress the moral significance of the human mind. Reality is non-conscious spiritual principle. It is unconscious psychic agency. It is pure thought. It is pure consciousness. It is pure Ego. Concrete Reality is personal "selfhood". Reality possesses self-consciousness. The relation of the Absolute or world-ground to finite selves varies in degree of unity and separateness with different philosophers. We are all centres of consciousness in the Absolute. Radical Monism essentially emphasizes the underlying spiritual oneness of the finite self with the Absolute. Radical Pluralism says, "each 'self' is distinct". or Pantheistic Idealism: "The finite self is a part, mode, aspect, moment, appearance or projection of the One." Each finite self is distinct from the other. It does not causally depend upon the One. may be subjective or objective. Subjective Idealism holds that "Nature is merely the projection of the finite mind, and has no external real existence". The term is, sometimes, used to say that "ontologically the Real consists of subjects, i.e. possessors of experience". The externally real Nature is only the thought or activity of the world-mind. In German the term means that finite minds are "parts, modes, moments, projections, appearances, members," of the Absolute Mind. Fichte's Idealism is objective. According to it, the order of nature is not merely a bundle of sensations. It existed before the individual mind experienced it. It exists after the mind has experienced it. It exists independently of the knowing mind. As such it is objective. But still, as Reality, it is psychic. The Absolute Mind, or Ego, contains all the entities in the universe. Things-in-themselves are due to the activity of the Absolute Ego. This Absolute Ego creates the sensations, as well as the content of matter contained in the sensations. It asserts a Universal Mind as the Reality. It is known by various names: the Absolute Mind, Absolute Experience, the Infinite, or the Absolute. It stands for "a super-personal or impersonal, logical consciousness". In the field of epistemology we have Theistic Platonism: "The archetypes - or perfect models - of existent things, are eternal Ideas in the mind of God." All entities other than egos, or subjects of experience, are exclusively noetic objects. They have no existence, or reality, apart from the relation of being thought or perceived. Knowledge comes partly from the inner mechanism of understanding and sensibility, and partly from external sensations of objects. It is a relational product. The Absolute, or Transcendental Reality, is there behind the phenomena, but it cannot be sensed. However, to some extent, it can be thought. That is why it is valid to think of God, Soul, Freedom, Immortality. But it is unwise to expect that one will ever be able to sense them. Nature gives its raw materials to the mind. These are sensations. Mind organizes them. Form imposed upon matter is the work of mind. Matter is dependent for its real existence upon the thing-in-itself. So, what we get through pure reason is form, the phenomena. The practical reason, or will, gives us suggestions of reality, or intuitions of Reality. The stress laid on will as Reality is the thesis of Voluntaristic Idealism. The world is will. Will is energizing phenomena. Phenomena are not reason functioning. Reason is subordinate to will. So is Man. Will always gets the better of reason. Will says, marry; reason says, do not. Will wins. According to Schopenhauer, the world is will. The thing-in-itself is will. The world is an expression of Universal Will, or world-will. It is Reality. says that non-ideal types of being are real. In its atheistic form it denies God's existence. In its theistic form - Realistic Theism - it admits that there is God. But, it says that side by side with God there are one or more kinds of non-mental being. They are either divinely created, or their ground is the Deity. They are, however, independent of God. The content of experience embodied in universal propositions and concepts is real. It is independent of knowing minds. Whether there be the race of man to think validly or all men go mad, the science of logic will not lose its reality. The non-mental content of concepts is objectively real. has been developed from Plato and Kant. The category of value comes logically and metaphysically before the category of being. We think of value first, in life as well as in Philosophy. d) moral freedom rather than psychological necessity. In China, T'ien or Heaven is the spiritual or moral power of cosmic and social order. Tao is the cosmic principle, an impersonal, immaterial world ground. "Wu Chi" is Pure Being. According to Shao Yung, the world is the content of a universal Consciousness. "Li" is the active moral, aesthetic and rational law. "Chi" is the passive ether stuff. Emphasiz on "Li" makes Chinese philosophy essentially idealistic. In Persia, the religion of Zarathustra was realistic and dualistic personalism. Nature is plastic. It is in the hands of Ahura Mazda, the personalized spirit of God. Ahriman, the personalized spirit of evil, struggles against Ahura Mazda, but in vain. The Jews believed in a cosmic "I". It exists as a personal and righteous world ground. It controls both nature and man. In India, the Vedas, the Upanishads and the Bhagavad Gita unfold the higher forms of idealism. Of the six systems of Indian Philosophy, the Vedanta is purely idealistic. The Idealism of Yoga-Vasishtha is subjective and monistic. According to Gaudapada, duality and plurality are illusory. His philosophy is Spiritual Monism. Shankara's Monistic Spiritualism is most popular and influential. The Absolute is pure Consciousness, "Sat-Chit-Ananda", Existence-Knowledge-Bliss. The individual is identical, absolutely identical, with the Absolute. According to it, "personality is the supreme value, and the key to the meaning of Reality". From Heraclitus in 536-470 B. C. up to our own day, Personalism has flourished in some form or other. Since Descartes, its influence has become a world force. Today, there are in America, Germany, France and England many thinkers who believe in "Personalism". God, or "a Divine Person", is the ultimate Reality of the world. He "sustains the universe by a continuous act of creative will". In metaphysics, the nature of the world-ground is personal. Epistemologically, the world ground is the source of valid thought and thinking. The world-ground is meditated on through personality. Logically, Personalism has been advocated in different forms by different philosophers. The problems of philosophy are concerning the nature of the Reality, of God, of the world, of purpose, of causality, of mind. Philosophy embraces all the higher questions concerning beauty (aesthetics), value (axiology), goodness (ethics), knowledge (epistemology and logic). Metaphysics deals with the presuppositions which underlie all experience, and tries to arrange these presuppositions into a system by showing that they are necessary deductions from the one ultimate first Principle. It seeks to trace the branches of human knowledge to their first principles in the constitution of our nature. It tries to penetrate into the world of appearances and to find out the supreme principle which shall explain human experience on all its sides. Cosmology is the general science of the cosmos, in all its parts, laws and operations so far as these can be known by observation and scientific inquiry. The totality of space, time and matter, make the cosmos. The universe as an embodiment of order and harmony, is cosmos. Cosmology is a theory relating to the structure of the universe and the laws which underlie it. Cosmology, a branch of philosophy, bases its theories on the fact that cosmos is apparently made up of matter and its phenomena, and of minds and their phenomena. [As we have seen,] Those philosophers who maintain that the cosmos constitutes both matter and mind, are dualists. Those who propound the sole existence of matter are materialists. Those who hold that mind is the basis of all things, that mind alone is, are idealists. Those who advance the theory of the non-existence of both matter and mind as substances, are phenomenalists. Agnostics speak to us of the unknowableness of both matter and mind, and those who postulate the absolute non-existence of matter and mind are the nihilists. This question of the nature and interrelationship of space and time, is only one of the many basic problems of cosmology. Some of the main cosmological inquiries are: is there an original ground of things, and what is its nature, and how does it change itself into particular things, into finite forms? What is the origin and nature of life in the universe? Is there a purpose or design in nature? What was the beginning of the world, and what is its end? The ancient Greeks looked upon water, air etc. as the ultimate elements out of which the variety of the world is composed. The Upanishadic Seers of India had, in their cosmological approach to the problem of Reality, said that the world of phenomena suggests the existence of a world of noumena, the changing world implies a permanent background in which the changes inhere. That permanent background from which all changes come, in which all changes subsist, and into which all changes are finally dissolved, is the Infinite, the Absolute. 3. How that truth or validity of the knowledge is again known. Different schools of philosophy treat epistemology differently. The materialists have their own theory of knowledge which is distinct from that of the rationalist. The type of position that scepticism advances in treating epistemology is altogether different from the one advanced by idealism. 4) from direct insight or intuition. Much of epistemology overlaps logic. As a preliminary to metaphysical speculations, it investigates the possibility and limits of knowledge. The culmination of epistemologic inquiry is the problem of truth which is the subject matter of metaphysics. Epistemology is the theory of "knowing". Logic and epistemology are different. Logic is the formal science of the principles governing valid thought and reasoning. Epistemology is the philosophical science of the nature of knowledge and truth. Is a particular reasoning valid? This is a logical problem. If it is valid, what kind of validity, ultimate or relational, does it possess? This is an epistemological problem. So, logic and epistemology are interrelated branches of knowledge. According to Kant and others, epistemology comes first. Without a theory of knowledge, metaphysical truth is impossible to get. According to Spinoza, Hegel, Whitehead and others, metaphysical truth comes first. The theory of philosophical knowledge is built afterwards so as to be in agreement with truth. Between these two extremes is the view that ontology and epistemology are interdependent. They are the two legs of metaphysics or philosophy. At every step each co-ordinates and advances the other. Without the presuppositions of metaphysics epistemology is impossible; without a working theory of knowledge metaphysics is impossible. Epistemology contacts psychology at a certain point only. Psychology deals with cognition, conation and affection. Epistemology deals with cognition. Both examine the cognitive processes, but the standpoints of the two are different. Psychology only analyses and describes the cognitive processes. Epistemology goes beyond to find the ultimate content of cognition. Psychology and epistemology are interdependent. Epistemology borrows its data about perception, memory, conception, imagination, reasoning and intellection, generally from psychology. The epistemologist, however, does not base his judgement of validity or otherwise, upon logic in psychology. 1) What is the possibility of knowledge? Is real knowledge at all possible? - Various answers have been given. Some of the important ones are Dogmatism, Scepticism, Criticism, Solipsism, Egocentric Predicament. 2) What are the limits of knowledge? Real knowledge may be possible only within certain limits and impossible beyond those. Positivism, Empiricism, Scepticism are some of the important answers. 3) What is the origin of knowledge? Does it come from reason independent of experience, or from experience? Rationalism and Empiricism are the most important answers that say it comes from both, partly from each. 4) What is the procedure of getting knowledge? The methodological problem is important. Rationalists emphasize the deductive and demonstrative procedure. Empirists have stressed induction and hypothesis. Almost all great philosophers have used both. Kant has his transcendental method. Hegel has his dialectical method. Pragmatism is William James' method. Operationism is a recent method. It examines the meaning of concept with reference to the concrete operations with which it is related. It is its functional reasoning in a certain field of operations. a) The theory of the intrinsic a priori. It sets up intrinsic standards of truth. These are irresistibly persuasive clarity and distinctness of ideas. Why are the basic principles of logic and mathematics taken to be axioms and postulates or self-evident truths? Because they are in clear and distinct ideas. It smacks of psychology. b) The presuppositional theory of the a priori. It is impossible to experience at all without presupposing time and space. According to Kant these are the "intuitions" of sensibility. If you lose sense of space and time experience vanishes. Again, you cannot experience without the categories of understanding. Even if you deny them, you presuppose them. A priori knowledge is a necessary presupposition of experience or of its own denial. c) The postulation theory of the a priori. The current postulates of recent mathematical knowledge are a priori in as much as they are taken for granted in constructing formal deductive systems. The Riemannian geometry of n-dimensions applying to an imaginary world of n-dimensions is based upon that sort of a priori knowledge. There is nothing in experience of its like. a) Non-inferential apprehension of objects. Knowledge of objects is got by perception, memory, imagination, etc. b) Inferential knowledge: the subject has no direct apprehension of objects. Knowledge comes to him directly by exercising reason and reflection upon facts. b) introspection or acquaintance of the subject with his inner self and its psychological states. Inferential knowledge is also called knowledge by description. Such knowledge includes knowledge of other selves, historical knowledge, and scientific knowledge. Knowledge of other selves does not essentially exclude, in exceptional cases, direct knowledge of others' selves which is intuitional knowledge. Historical knowledge is not restricted to the cramming up of a textbook or manual of events. It includes astronomical, biological, anthropological, archaeological and even cosmological reconstructions of the past. 7) What is the subject-object relation in the knowing process? What is the knowing process itself ultimately? It is the problem of the structure of the knowledge situation. The answers are subjectivism, pan-objectivism, and representative perception. According to subjectivism, the object merges in the knowing subject. According to pan-objectivism, the knowing subject merges in the object. Representative perception is a compromise between these two extreme positions. Primary qualities are objective and secondary qualities are subjective. Perception results when both join hands. a) are content and object identical, Epistemological Monism becomes established. If numerically distinct, Epistemological Dualism results. b) Does the object exist independently of the knowing subject, or is it dependent upon the subject? If the former, we have Epistemological Idealism. If the latter, we have Epistemological Realism. 8) What is the criterion of truth? The problem of truth is common to epistemology and metaphysics. At the point of truth, the two converge. What is the nature of truth? a) According to the correspondence theory, truth is a relation between an idea and its objective content. Commonly, the relation is correspondence or agreement. Gold is yellow. Here the yellowness of gold is the ideal content. It corresponds with, or agrees with, the actual characteristic of gold. This is also called the realistic conception of truth. The axiom of realism, Sellars states as follows, "Knowledge unconditionally presupposes that the reality known exists independently of the knowledge of it, that we know it as it exists in this independence." In simpler words, reality exists whether we know it or not. Indeed that alone is real which does not depend for its existence upon our perception. Its chief difficulty is that we have no means of verifying knowledge outside perception. b) According to the coherence theory of Truth, truth is the relation of consistency, or internal coherence between all parts of our experience. The criterion of truth is the logical consistency of the proposition with a wider system of propositions. c) According to the intrinsic theory of truth, truth carries its own criterion intrinsically. Pragmatism may be included in it. The pragmatic theory of truth is this: Truth is that which "works" or "satisfies", although it may not be causally explainable. You cannot prove the laws of motion, but you can solve your mechanical problems with their help. They "work", so they are true. Man is a thinking being. He has the power of thought. Thought is a process; and, every process has its own laws, known or unknown. The active function of the mind by which impressions received from within or from without, are described, classified and compared, persuaded reflective men, who were capable of observing their own thought-processes, to draw out rules and laws to which thought adheres with unfailing strictness. Thus we see that logic arises from the reflection of the mind upon its own processes, and he is a logician who is capable of declaring how he thinks. Our thoughts are formed by laws; and when we conceive, abstract, define, judge and deduce, we put in practice so many ascertainable principles. Pure Logic is the science of the necessary laws of thought in their own nature. Applied Logic is the science of the necessary laws of thought as employed in attaining truth. Logic is the science of the principles which regulate valid thought. It is concerned primarily with the validity of the process of reasoning; it sees if the materials of our knowledge are in agreement with reality. It examines whether the conclusion of an argument which is expressed in a judgement is consistent with itself, and whether it expresses the relations existing between the things concerning which the judgement is made. Logic is a part of philosophy. It is a guard against errors in reasoning. It is a mental discipline that is used for developing and perfecting the reasoning powers. Formal logic is concerned with the self-consistency of thought: material logic with its objective truth. By the matter of thought is meant the thing thought about; form of thought is the way the matter is considered. In so far as the distinctions of language correspond with the distinctions of thought, logic is related with language, and there is a rudimentary relation between logic and metaphysics, logic and psychology, logic and rhetoric. Logic is widest in its scope. Many are the names of Logic, viz. the Architectonic Art; the Instrument, or Organum, and the Instrument of Instruments, the Art of Arts, the System of Systems; the Key of Wisdom; the Head and Crown of Philosophy; the Art of Discovering Truth; the Carthartic of the Mind. These pompous titles bestowed on the science of logic should not mislead us into exaggerating the value of logic. It has its own limitations and has only an instrumental value. 3) the Law of Excluded Middle. Axiology is a branch of philosophy that deals with the theory of values. It deals with the higher values of life. It is the science of values. It investigates the "nature, criteria, and metaphysical status" of values. What is desired or preferred or regarded as good is value. What is the nature of values? What is the comparative standard of values? What is the highest value, the summum bonum? Ultimately, what is value? With these questions axiology deals. To prefer one thing over another is to value it. Valuation is "unreflective" in the animals. They are not conscious when they select what is conducive to their life. In man alone valuation is deliberative. It may be effortless as in the case of the artist. The general questions that arise are: is the valuation connected with feeling or with willing? Is value outside our minds in the object, i.e., objective, or is value subjective, i.e., does it depend upon fulfilling human purposes? What are the diverse kinds of values? What are the supreme values of life, and what is the relation between them? Special values are studied by special sciences: logic studies validity, ethics studies character, aesthetics studies beauty. Anything we desire, need or want, for its own sake, or for the sake of something else, is value. Value is both subjective and objective. Values reside in objects but refer to the human mind. Values may be physical, economic, political, aesthetic, moral, intellectual and religious. A value desired for its own sake is called intrinsic, such as truth, beauty, goodness. A value desired as a means for something else is called extrinsic or instrumental, for example, money. Philosophy is concerned with intrinsic values only. Aristotle identified the highest value with final causes in God as "a living being, eternal, most good". The interest in the study of values ranges from sense to nonsense. According to Dewey, "not only a science itself is a value - but it is the supreme means of the valid determination of all valuations." On the other hand A. J. Ayer says, "according to logical positivism value is nonsense". 4) the metaphysical status of value. What sort of experience is value? Voluntarism: Spinoza says that it is the fulfilment of desire. Hedonism: Epicurus, Bentham say that it is pleasure. Rationalism: Kant, the Stoic say that it is pure rational will, "Nothing is good but goodwill itself". Personalism: T. H. Green says that it is the synoptic experience of the unity of personality. Evolutionism: Nietzsche says that it is any experience that contributes to enhanced life. Pragmatism (William James) or Instrumentalism: Dewey says, value is the "relation of things as means to the end or consequence actually reached". Individual philosophers have held personal opinions. Perry says value is interest. Marineau says it is preference. Santayana says it is the apprehension of tertiary qualities. Indian philosophy holds that value is the realization of the supreme Being. Some values are intrinsic. They are consummative ends. They are sought for themselves. The good, the true, the beautiful and the holy are intrinsic values. Other values are instrumental. They are contributory means for the realization of other values. Some instrumental values are neutral intrinsically - they do not lead to any philosophical values. Some instrumental values are intrinsically disvaluable - they lead to results offending philosophy. Play, work, association, and bodily well-being are also values, but they are more utilitarian and artistic than philosophic. Love of truth, regardless of consequences, is a value. The true may sometimes in life be neutral or disvaluable, but it does not affect the love of truth as a philosophic value. According to some, the holy is a unique type of value. But Kant says that it is an attitude towards other values. Professor Hocking says the holy is at once a unique type of value and an attitude towards other values. Some philosophers say that there are more values than one. - Pluralism. Others, like Plato and Hegel, maintain that all values can be put into a system so as to form the total experience. What is the standard by which value is to be judged? Both logic and psychology contribute to the answers. Hedonists set up the standard of quantitative pleasure derived by the individual or society. Intuitionists appeal to an ultimate insight into preference. Idealists, like Plato, cognize objective systems or rational forms or ideas as the standard. Idealists like Hegel, emphasize rational wholeness and coherence or inclusiveness. Naturalists find biological survival, or adjustment to environment, as the standard. What is the relation of values to scientific facts, or to the absolute Reality? Three different answers have been given. a) Subjectivism: hedonists, naturalists and positivists say that value is entirely dependent on the conscious experience of the normal man. It is relative to human experience. Even the sense of value of a genius like Coleridge, or Shelley, is of no significance if it is not intellectually accessible, in all its fervour, to the average man. b) Logical Objectivism: values are logical essences. It matters little whether man knows them or not. Yet, in reality, they have no status of existence or of action. Values exist in relations. c) Metaphysical Objectivism: Theists and absolutists assert that values are there in the being and fibre of Reality. Ideals or norms are values. They are integral, objective and active constituents of the metaphysically Real. Value is, in simpler words, an aspect of God or of the absolute Existence-Consciousness-Delight. Axiology studies the value of life, art, philosophy, religion and the sciences. The most important is the religious value. God is the supreme religious value. The goal of life is the practice of the Presence of God. God-Realization is the summum bonum. People have believed in God in different ways and forms. They lose faith in God because their selfish motives are either not fulfilled, or because their fulfilment leaves them no time to believe in God. Polytheism: There are many gods. Paganism holds that they are separate and jealous of one another. Hinduism reconciles them all. All are beautifully harmonised in the impersonal Absolute. Monotheism: God is one and only one. He is immanent as well as deistic [see below]. He is the Creator, Destroyer and Preserver. God alone is real. All else is illusion. Monotheism may be deistic, pantheistic, or theistic. Deism: God is outside the universe. He controls the world from outside. Pantheism: God is within the universe. He is immanent in the universe. So He is everywhere. 'Pan' means all. 'Theos' means God. Pantheism means God is all and all is God. Spinoza was a notable pantheist. Theism: It reconciles Deism and Pantheism. God is not merely within the Universe. God is certainly immanent but He is also very much beyond the universe. The universe is so small that it is contained in God. God is thus personal. All thinkers now believe in Theism. Atheism: God, as such, does not exist. Practically nobody believes in atheism. If not in God, he believes in some similar being. Agnosticism: Knowledge of God is impossible. Positivism: God is Humanity. Serve humanity! - that is the best worship of God. How can you prove that God exists? It is intellectualism to prove or to disprove God. Every argument that the intellect offers can be refuted by the intellect. But, there are some famous proofs of the existence of God. By God, today science and philosophy understand, in the words of Patick: "God is the soul of the world, an indwelling spiritual presence, a creative, organizing and perfecting power, the source of our moral, religious and aesthetic ideals". The present tendency is not to demand proofs of God's existence but to realize Him in life. The proofs may be stated. If values are real what is their source? God is the source and fountain of the ideals whose pursuit is the goal of human life. You always feel, "I exist". One can never deny one's existence, can one? So, denying one's existence is quite absurd and illogical. In denying one's existence, one denies one's own self. Existence is God or one's own inner immortal Self. Though one is encaged in this finite body, though one is imperfect and mortal on account of egoism, one can think "I am infinite, perfect, immortal Being." Though one is finite, one is capable of having an idea of the most perfect Being which fills all space, which contains everything, beyond which nothing can be conceived of and where all desires come to infinite fulfilment. This idea of Infinity can arise only from an infinite Being. Hence the infinite Being or God exists. The idea of God somehow guarantees its own truth. The very notion of a supreme Being is an intrinsic truth. From the very nature of the idea of perfection embodied in God, it follows that He must be. One can deny one's own self; one can deny the existence of God, doubt the existence of one's own self and God. But the doubter or denier always exists! The existence of the doubter or denier is God, Brahman or the Absolute. In this world of phenomena, there is cause for everything. The law of cause and effect operates. There is the cause, father, for the effect, child. There is the cause, seed, for the effect, tree. There is the cause, potter, for the effect, pot. A branch of a tree moves. The blowing of the wind, or the sitting of a bird is the cause for the movement of a branch on a tree. One sees this world. There must be a cause for this world, the effect. But one may say that this cause of the world may be the effect of some other cause. But, you cannot stretch this kind of argument without ending it in infinite regress. A causeless ultimate Cause must be admitted in order to avoid logical fallacy. That causeless Cause is God or the Creator. This was the famous argument employed by Plato, Aristotle and Thomas Aquinas. It is a beautiful argument. Everything is changing in this world. There must be a substratum which is unchanging. One cannot think of a changing thing without thinking of something which is unchanging. Forms are finite. One cannot think of a finite object without thinking of something beyond, without thinking of the Infinite. The universe is order, adaptation, and beauty. There is benevolent design in the universe. The universe is a work of art. And the artist is all goodness, too. Who is it then? God! There are beauty, intelligent beings, luminosity, law, order, harmony in spite of apparent disorder and disharmony. There must be an omniscient, omnipotent and omnipresent Being who governs and controls this vast universe. To Kant, "belief in the existence of God is a demand of our practical reason or moral consciousness." So we must believe in His existence as a matter of faith or moral conviction. Through God alone virtue triumphs. There is a display of intelligence in every inch of creation. The divine Hand is operating everywhere. Can my brother the psychologist manufacture a mind? Can the scientists explain whence the laws of nature are? It is obvious that ever since the beginning of creation some miraculous and mysterious Power has been at work. One may call this, 'Mysterious Power', or 'Father in Heaven', 'Jehovah', 'Allah', 'Substance', 'Essence', 'Brahman', 'Ahura-Mazda'. We have a will to believe in God's existence. It works in life. It is better to believe in God through hope than to despair through fear and doubt. These problems are all practical. Theoretical solution, however brilliant, is not good. For the practical aspirants the sure method of God-Experience is through daily spiritual disciplines. The important disciplines are prayer, meditation, constant practice of God's Presence, selfless service, study of inspiring spiritual literature, association with wise spiritual individuals, simple living, higher thinking, development of universal love.